» Yearly Eriophorum vaginatum Flowering data along a transect on the Haul Road, Fairbanks to Prudhoe Bay, AK 1979 to present. Definition: Month flowers were counted. Definition: Code for the site used when encoding data for older computers. Definition: Name of the site. 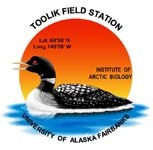 Definition: The plot number, used only for Toolik Site. Definition: The rep number, used for all sites except Toolik. Definition: A six number code for the treatment – The code from left to right is N Level, P Level, K Level, Sugar Level, Lime Level, Control. For NPK fertilizer, sugar and lime: 0=nothing, 1=low, 2=medium, 3=high, 4=Galbraith NPK '78, 5=MS117 NPK '78 and '76, 6=MS119 Track '81, 7=MS127 NPK '78 and '76, 8=Atigun Greenhouse. For the control: 0=no control, 1=C38 standard, 2=C37 alternate, 3=C36, 4=C39, 5=C40, 6=C45, 7='new' control 8=not a treatment nor control, 9=duplicate sample. Definition: The number of flowering tussocks. This data is not always present. Definition: The number of flowering tillers per plot. Definition: Number of tussocks per plot. Only collected some years. Label: Include in grand avg.